How to Make the Thinnest Possible Pastry This is the beginning of a series related to the newly published The Baking Bible. The intention is to give you extra information and possibilities and some behind the scenes production photos that might be of interest. When I make a galette, which is essentially a fruit pizza using flaky pie crust, I like to roll it as thinly as possible--about 1/16 inch compared the a pie crust which I roll 1/8 inch or slightly less. I find it has a better balance of crust to fruit. In the recipe for the Peach Galette, in The Baking Bible, however, I gave enough dough and instructions to roll 1/8 inch thick because several of the testers had trouble rolling the dough thinly enough. So here is the technique for how this can be done. 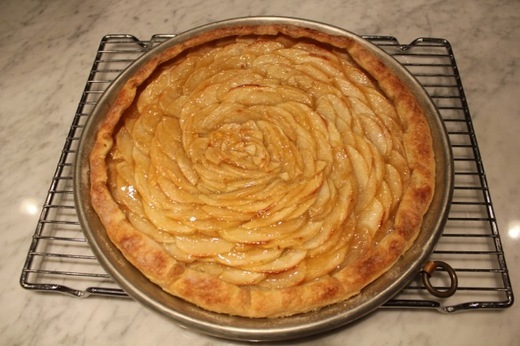 It does require a pastry cloth to prevent sticking. 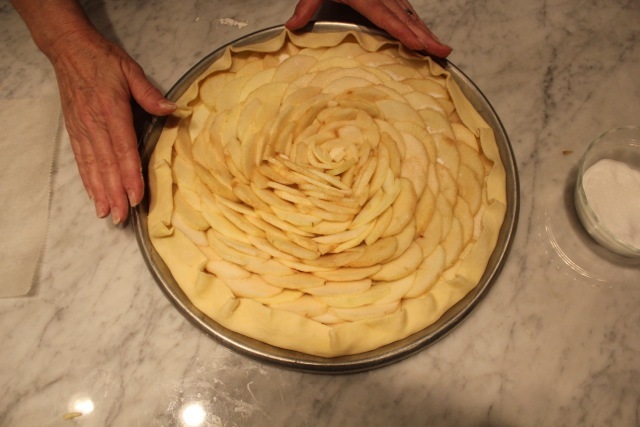 Also, for the Peach Galette I like to overlap the dough so that it covers almost the entire fruit, whereas for the Apple Galette I only want a 1-1/2 inch border to display the beauty of the design. Also I use less dough. 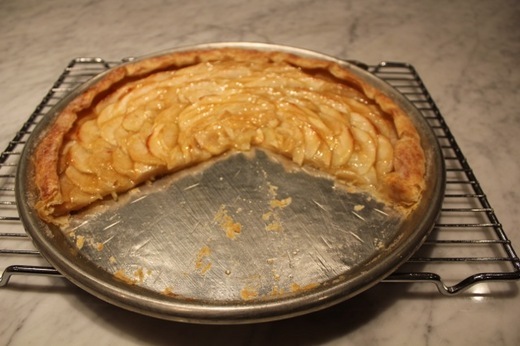 Instead of using the flaky pie crust with 4 ounces/113 grams of butter I use the one with 3 ounces/85 grams of butter. I omit the baking powder and double the salt as the light layer of apples in the middle would cause it to rise up. If I forget, I just poke it with a wooden skewer to deflate it. I love the 19-inch pastry board from Bethany Housewares which comes with an elasticized round cloth. I also love my commercial heavy duty rolling pin which I bought many years ago from a commercial supply house. I cover it with knitted sleeve. They often come with pastry cloths but for a really long one, purchase knitted sleeve tubing from a pharmacy, that is designed to cover casts. A long rolling pin is essential and a heavy pin helps to roll out the dough more quickly, keeping it chilled. 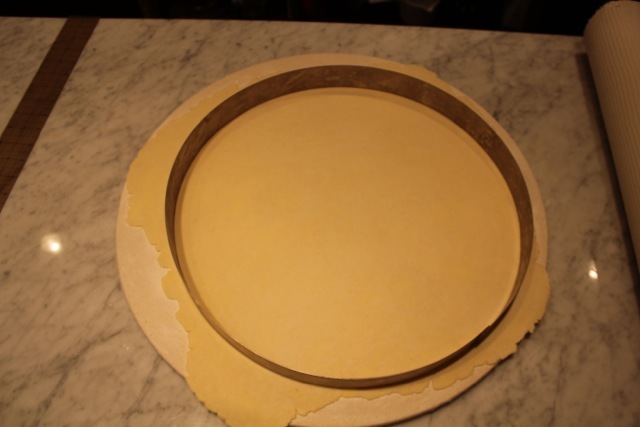 Bethany Pastry Board and Cloth Set An optional but very useful item is a 16-inch flan ring for cutting the dough disc so that it has an even edge but this can also be done by making a cardboard template and using a sharp knife. (Note the Allied Metal link is available only for food service.) 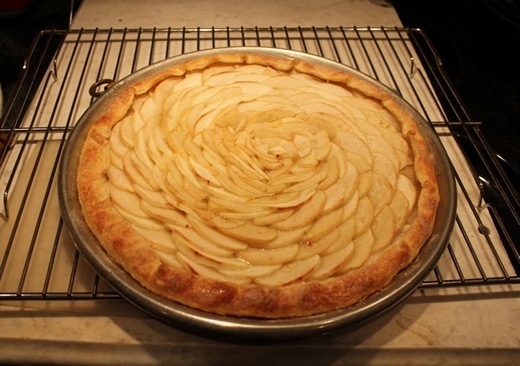 Set an oven rack at the lowest level and set a baking stone on top for a crisp bottom crust. Preheat the oven to 400°F/200°C at least 40 minutes before baking. 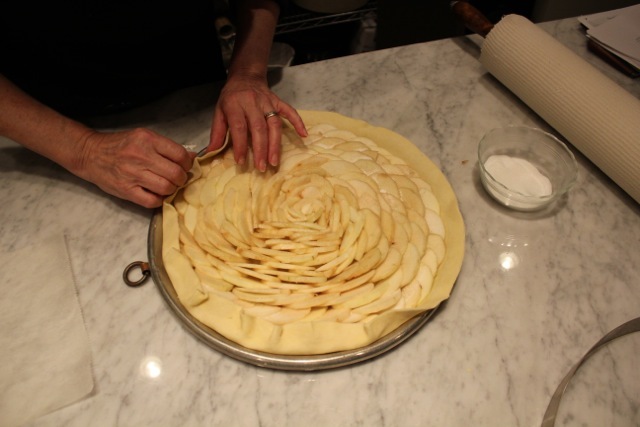 If your kitchen is warm, wait to preheat the oven until after rolling the dough and refrigerate the completed galette lightly covered with plastic wrap until ready to bake. 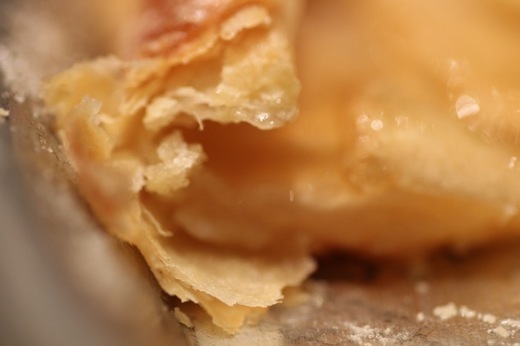 The first step is to rub flour into the pastry cloth and sleeve to prevent sticking. 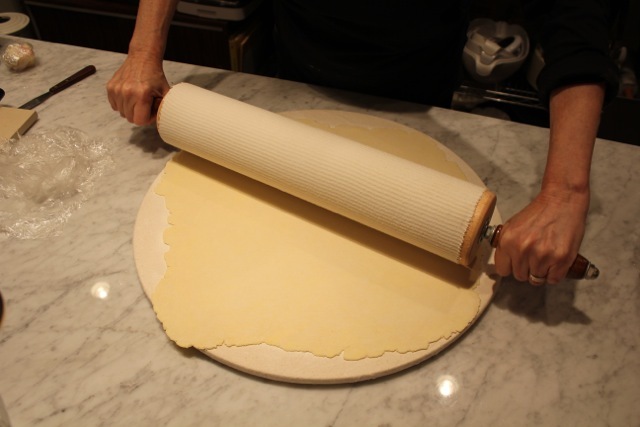 Then evenly roll the dough to a large thin disc. In most places it should be between 17 and 19 inches in diameter so that you can cut an even 16 inch disc. Use a flan ring or a sharp knife, with a cardboard template as a guide, to cut the disc. I like to use my 12-inch copper farinata pan from Italy or a heavy dark metal pan from France. 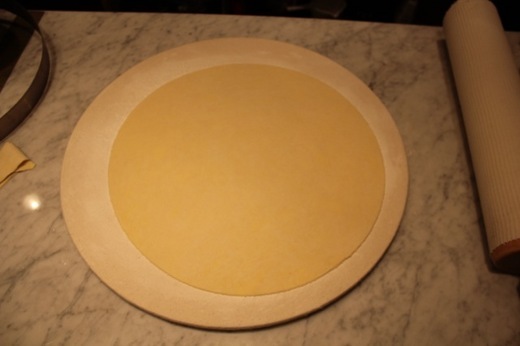 To transfer the large piece of dough to the pan, I fold it in quarters to make lifting it easier. Starting toward the outer edge of the dough, overlap the apples in concentric circles. 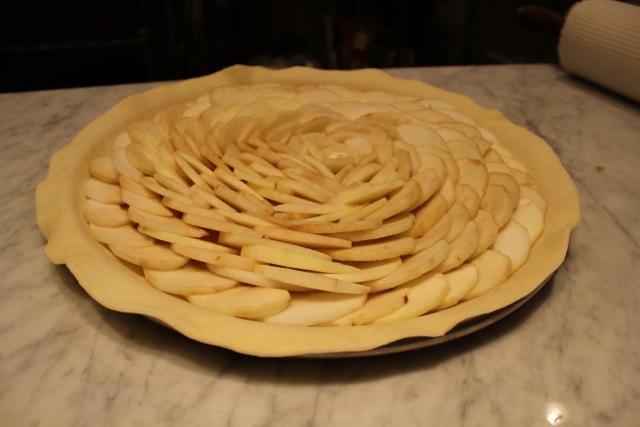 I use about 4 apples (21.25 ounces/604 grams) and in order the make the center apples curve I either sprinkle them with sugar to let them soften or microwave them for a few seconds. Sprinkle the apples evenly with most of 1/4 cup/1.7 ounces/50 grams of superfine sugar, saving a little for the dough border. 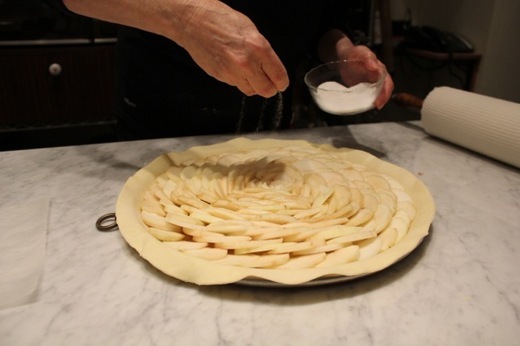 Gently curve in the border of the dough over the apples, allowing it to pleat. Spritz the dough border with water and then use the remaining sugar to sprinkle on top for a delightfully crisp crust. 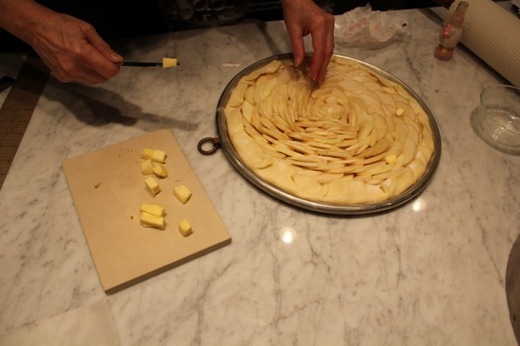 Dot the apples with butter (2 tablespoons/1 ounce/28 grams). Bake for 20 minutes. 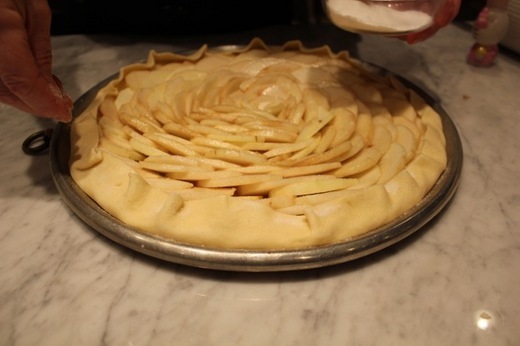 Rotate the pan and continue baking for another 20 minutes or until golden brown and the apples are tender when pierced with a skewer. Allow the tart to cool until warm, and then brush with about 1/4 cup of strained apricot preserves. This offers a lilting flavor and golden glisten. Best eaten still warm, the day of baking.